High cholesterol levels are often inherited. The other cause is of course eating foods too high in fat and cholesterol. But the difficulty in lowering cholesterol is compounded when you have a condition known as Familial Hyperlipidemia. This is a genetic condition that is marked by high levels of blood fat, high serum low density lipoprotein (LDL) cholesterol, low levels of high density lipoprotein (HDL) cholesterol, and a family history of heart disease. Familial Hyperlipidemia usually shows up during the teen years. Children have extremely high cholesterol levels, are often obese, and sometimes also have diabetes or trouble regulating blood glucose. Sometimes there will be chest pain, called angina, associate with the condition. The real threat and problem medical professionals try to treat in those with Familial Hyperlipidemia is to avoid damage to the heart. The first line of defense against the disorder is to change ones diet. 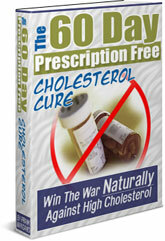 If this doesn’t work, then the traditional cholesterol lowering drugs are prescribed. The drugs often are accompanied by undesirable side effects, so working on diet and exercise are usually a more desirable treatment option especially in children and teens. People with Familial Hyperlipidemia are at greater risk of atherosclerotic heart disease and myocardial tissue death. Both are the result of a lack of blood reaching the heart because of restricted blood flow from cholesterol-clogged arteries. If the blood flow to the brain is restricted then stroke can occur. Losing weight and making successful dietary changes are paramount in people with Familial Hyperlipidemia. This will help reduce their risk of cardiovascular disease by lowering cholesterol. To learn how to create a cholesterol lowering diet and exercise plan, get The 60-Day Prescription Free Cholesterol Cure by Frank Mangano. This proven method will lower cholesterol naturally through sound nutritional education and planning.